A blast on goal from a Umatilla forward makes its way past Irrigon defenders and sends the Knights goalie flying in an attempt to block the shot. UMATILLA - The Umatilla Vikings hosted the Irrigon Knights in a soccer match at the new soccer field on 11th near the Marina on Thursday. 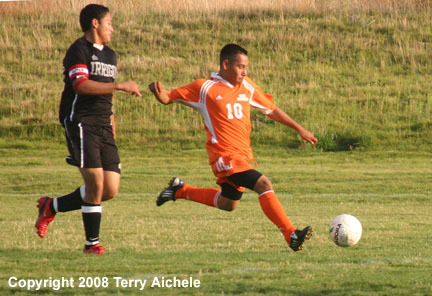 Umatilla won 6-0. Umatilla scored the first goal at about the fouth minute of the first half. The second goal for the Vikings came in about the 11th minute of first with a shot from the left side of the goal by number 8. The third Viking goal came about 15 minutes into the match off a corner kick. The final Viking goal of the half was off a header in about the 37th minute. Umatilla took a 4-0 lead into halftime. 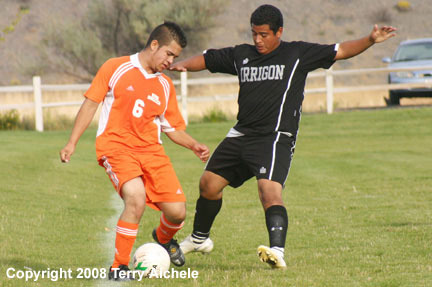 The goals were fewer in the second half as Irrigon's defense began to work and they took the ball into the Umatilla zone more often. Umatilla scored a goal at about the ten minute mark of the second half to take a 5-0 lead. Umatilla increased pressure late in the match and was able to score the final goal in the 35 minute of the second half to take a 6-0 win. 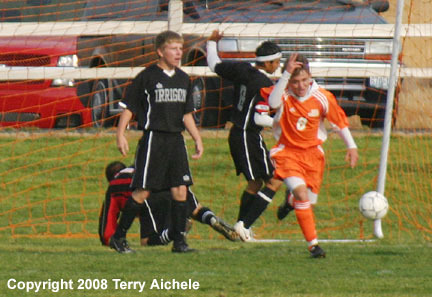 LEFT - A Umatilla player, in orange, celebrates a goal in the eleventh minute of play on Thursday. 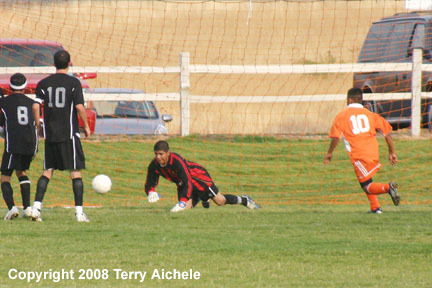 RIGHT - Umatilla put constant pressure on the Irrigon goalie throughout the match. 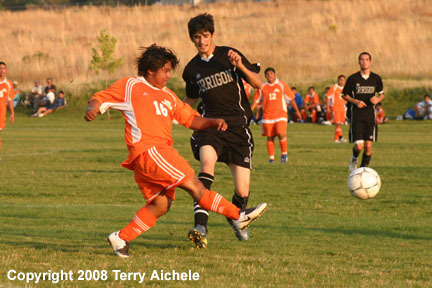 LEFT - A Umatilla player steals the ball from an Irrigon player. RIGHT - A Umatilla player heads the ball. 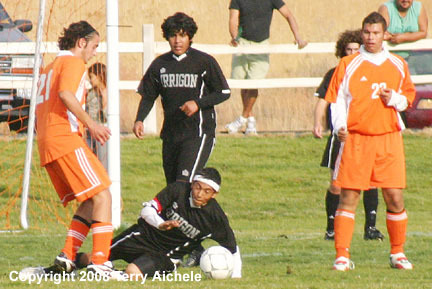 LEFT - An Irrigon player uses his body to shield the goal from a Umatilla forward. 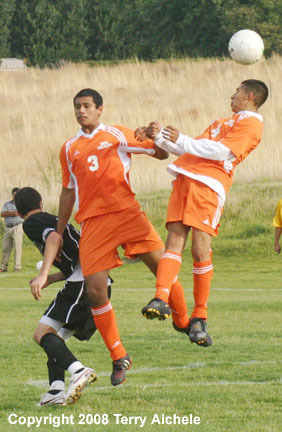 RIGHT - A Umatilla player threads a shot between Irrigon defenders. 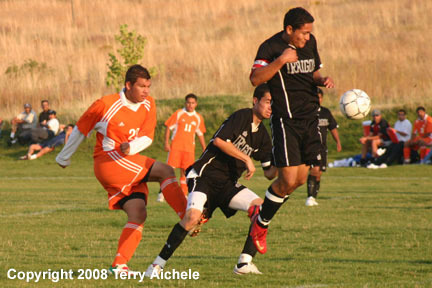 LEFT - A Umatilla player lets fly with a shot from the left side of the Irrigon zone. 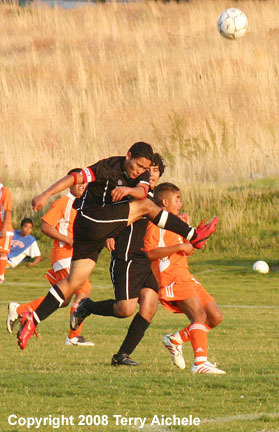 RIGHT - An Irrigon player leaps in an attempt to block a Umatilla shot. 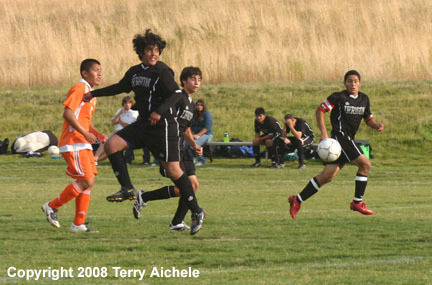 LEFT - An Irrigon player heads the ball away from a Umatilla player. 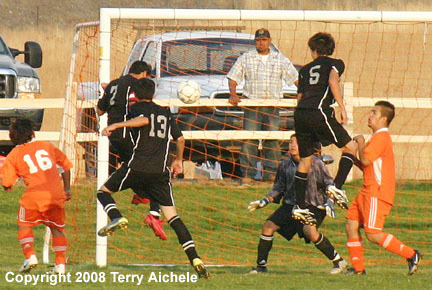 RIGHT - Irrigon attempts a shot on the Umatilla goal. LEFT - A Umatilla player takes a shot. 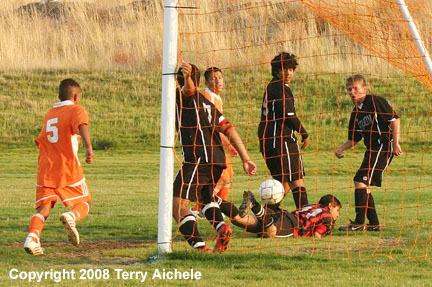 RIGHT - A Umatilla goal rolls in past the Irrigon's stretched out goalie.